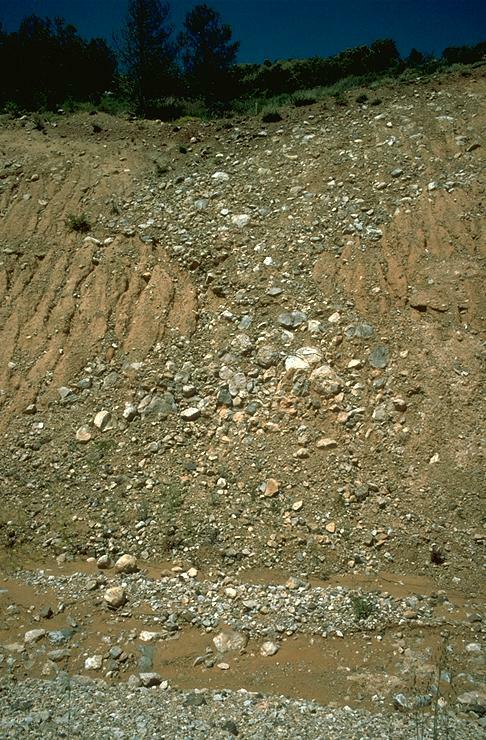 The Puerto Mínguez (Fig.1) was first described as the location of an “enigmatic” deposit of Paleozoic quartzite clasts . By road construction meanwhile continuously exposed over 5 km length, the deposit is now considered part of an enormous impact ejecta blanket around the Azuara and Rubielos de la Cérida twin impact structures [2, 3]. Fig.1. Location map for the Puerto Mínguez. Encircled are the Azuara and Rubielos de la Cérida impact structures. Fig.2. 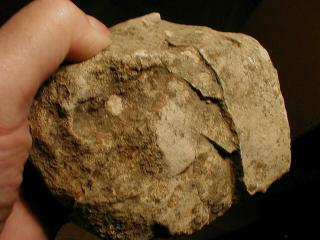 Typical diamict aspect of the impact ejecta. Stratigraphically, the Puerto Mínguez deposits consist of uncemented and frequently intermixed Paleozoic, Mesozoic, and Lower Tertiary material. The mixed cobble and block components show variable morphology (well-rounded, sub-rounded, and angular), and are supported by a sandy and marly matrix. 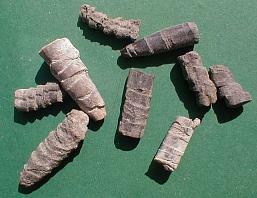 Megablocks with preserved stratification and original characteristics are also intermixed within the deposit. Fig.3. Mesoscopic deformations in the Puerto Mínguez impact ejecta: Striae, grooves, polish, imprints, and faceted sculpture. Most of the pebbles, cobbles and blocks are strongly deformed (Figs.3-5). They show striations all around (including nailhead striae), penetration marks, deep grooves, rotated fractures, and irregular fractures with complex bifurcations. An intense internal torsion of many cobbles and blocks is documented by hinges and rotated fractures (Fig.4). The rotated fractures (first described for the Pelarda Fm. ejecta ), may result from pure torsion, or from a superposition of torsion and tension. 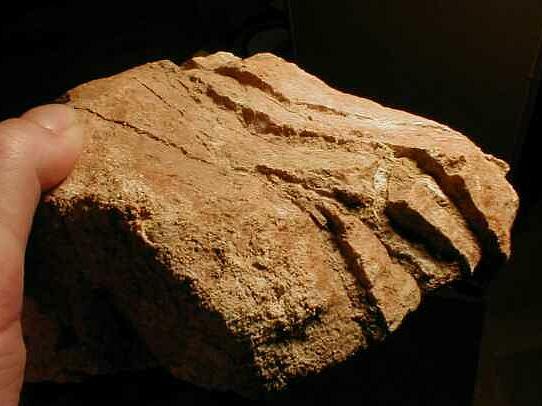 Fractured components frequently resemble bread cut into slices, but the clasts remain coherent (as do the clasts with the rotated fractures), and are not broken into pieces (Fig.5). Fig.4. Rotated fractures in clasts from the Puerto Mínguez ejecta. Fig.5. “Bread-cut-to-slices” features in a clast from the Puerto Mínguez ejecta (left) and from the Ries Crater Bunte Breccia ejecta (Belemnite rostra and carbonate concretion, middle and right). Conclusions. – From the analysis of the lithologic characteristics, surface features, and intense deformations of the components and the matrix of the Puerto Minguez deposits, we conclude that the origin of these features is connected with simultaneous plastic and brittle deformation, acting rapidly, and under high contact pressure between the matrix and larger components. Especially the rotated fractures and the “bread-cut-to-slices features” are regarded as typical of dynamic, rapid deformation. Deformations as observed at the Puerto Mínguez occur under high confining pressure in an impact event and are observed in other impact ejecta (e.g., the Ries Crater (Fig.5), the Azuara and the Chicxulub impact structures) [4-6, and others]. They are not compatible with an origin from fluvial deposition, quasi-static tectonics, the action of glaciers, or syn-tectonic sedimentation . The observations and analyses presented here may serve as a strong diagnostic tool for impact-related diamictites. References:  Moissenet, E. et al. (1972) Melanges casa Velazquez, 8: 1-47;  Ernstson, K. et al., 1985, Earth Planet.Sci.Let., 74, 361-370  Ernstson, K. et al., this workshop;  Ernstson, K. and Claudin, F., 1990. N.Jb.Geol.Paläont.Mh., 1990, 581-599;  Rampino, M.R. et al. (1997) Abstracts Conference on Large Meteorite Impacts & Planetary Evolution, Sudbury, Ontario, Canada;  Chao, E.C.T. (1976) Science, 194: 615-618;  Casas, R. et al. (2000) Geodinamica Acta , nº , 1-17.